The "Adopt-A-School" initiative's main goal is to provide students from high need schools an opportunity to play and learn the wonderful game of chess. Warren and Wesley feel very blessed and fortunate to have support from their family and environment to play chess from a very young age. 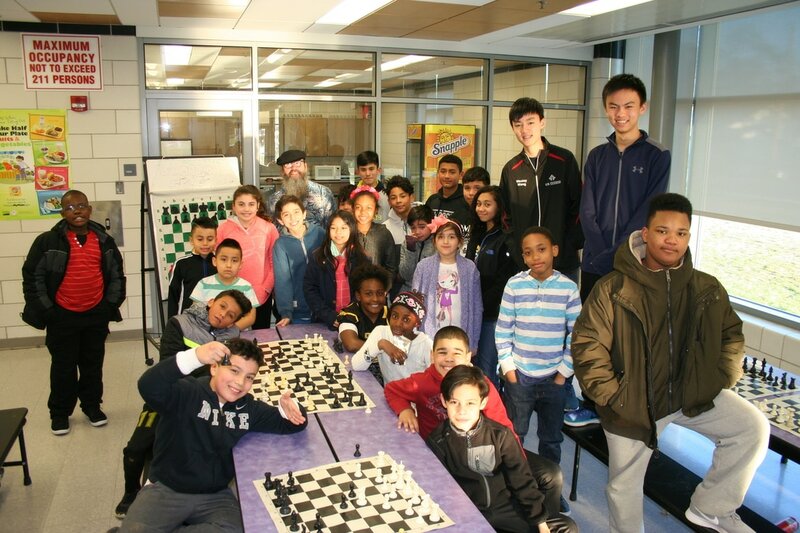 During their chess career, they have met and competed with many kids who could have done as well as they had if they had same amount of resources. 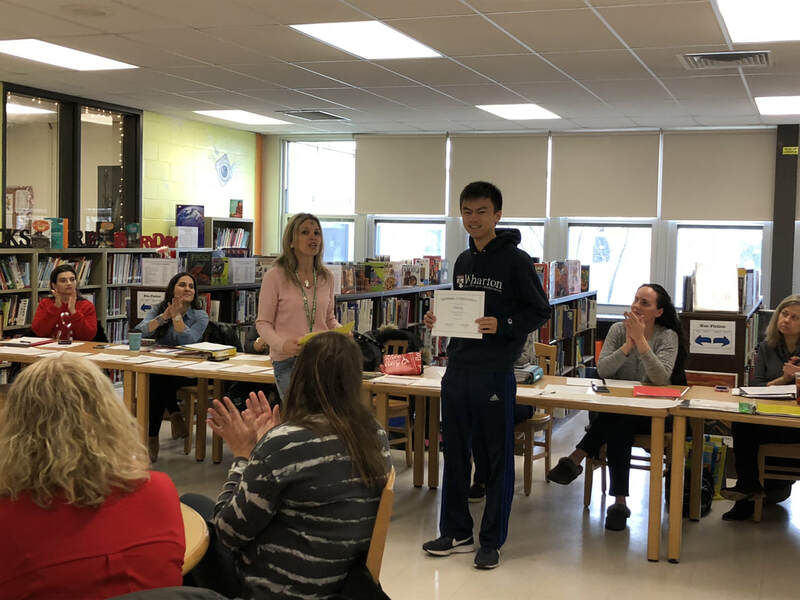 A few trips with Jericho High School Badminton Varsity Team to some resource-lacking schools prompted Warren to think about doing something for such communities. After a discussion with his parents and his brother, Warren began enacting his plan and thus, the “Adopt a School” initiative was born. Warren and Wesley will donate their earnings from their Future Masters classes to a few such underprivileged schools. The goal is to maintain the supply of chess boards/sets for various school districts in such communities and to conduct occasional free chess clinics for the students. 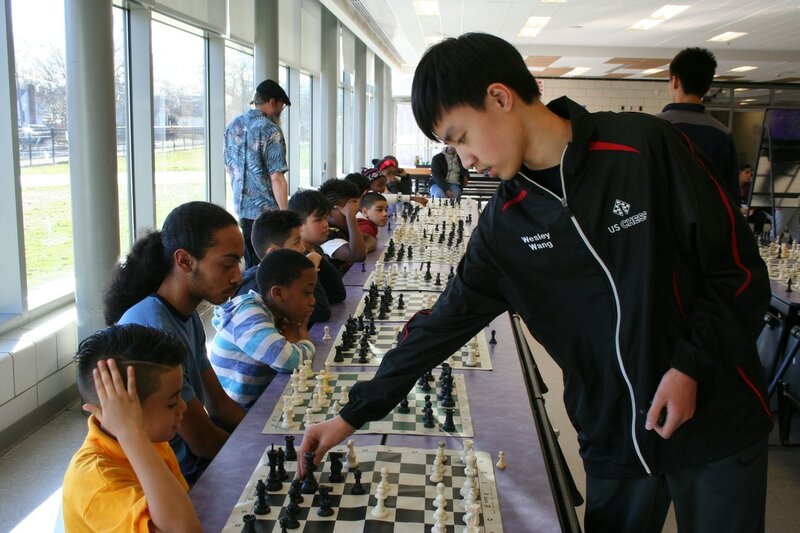 Recently, CHESSantiy has expanded its reach to other parts of the country, with the establishemet of its first chapter, Ohio Chapter, to support hundred of schools in OH area. Warren and Wesley meeting with the Wyandanch Board of Education (9/14/16). 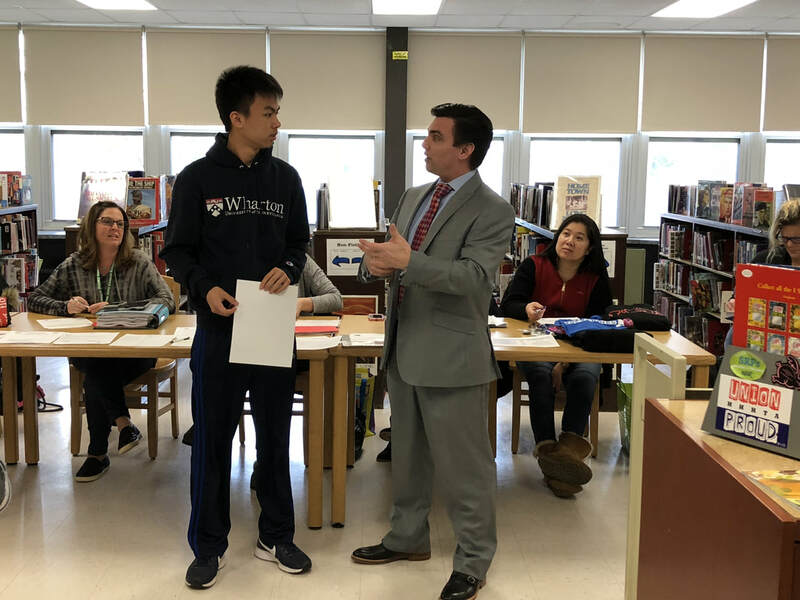 At the Wyandanch Board of Education meeting on September 14th, 2016, Warren and Wesley made a formal presentation to the board members of their charitable intentions, detailing CHESSanity's mission and the benefits of playing chess. 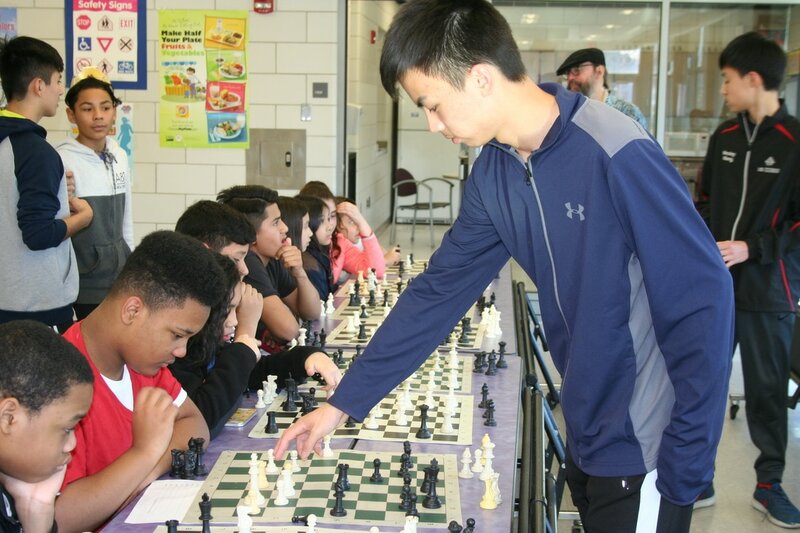 CHESSanity's generous donation was well-received by the school and community residents; as a result, the board is exploring the possibility to introduce chess across the school district. 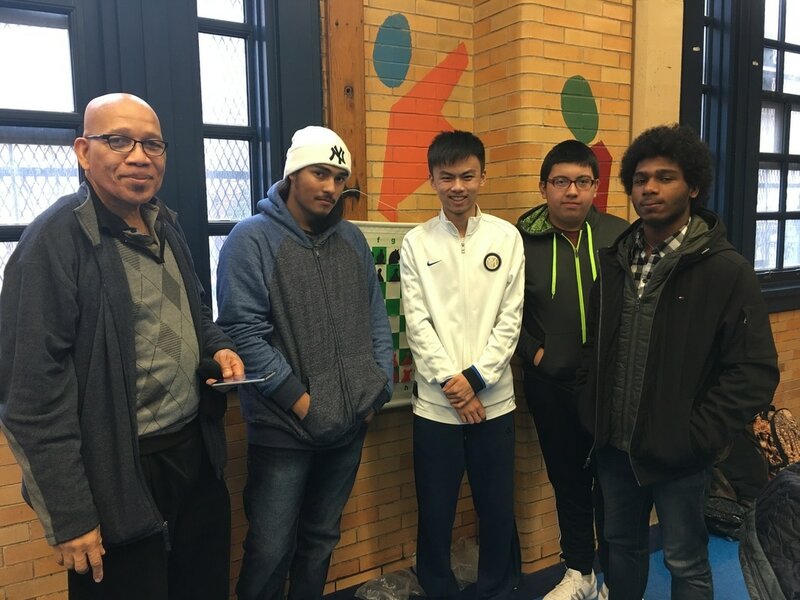 Warren with 3 members of the Wyandanch Chess Club at their first official chess tournament in Queens, NY (1/21/17). 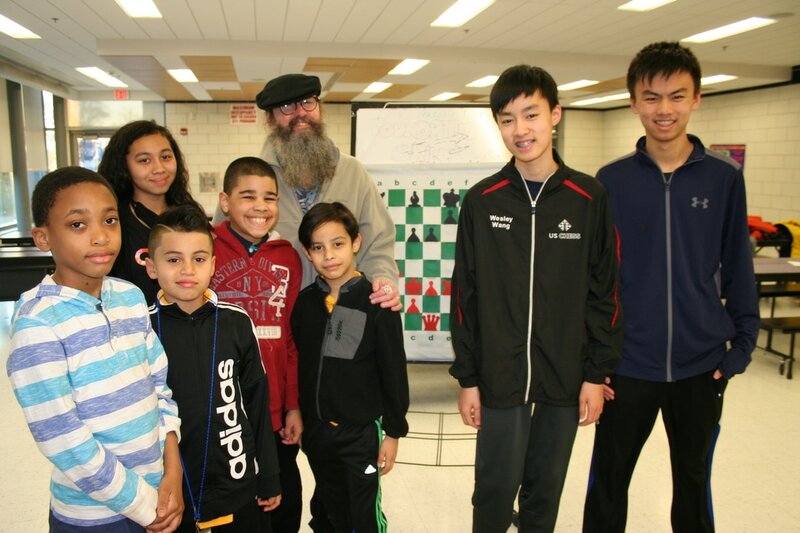 On January 21st, 2017, CHESSanity sponsored a trip to Queens for any willing members of the Wyandanch Chess Club for an official chess tournament. At the tournament, Warren spent time between rounds giving tips and pointers to the students, and even played a few exhibition games against them. Although only three of the 25 in the newly assembled chess club attended (we hope to receive more in future events! ), overall, the event was a success; the students seemed to enjoy themselves there! 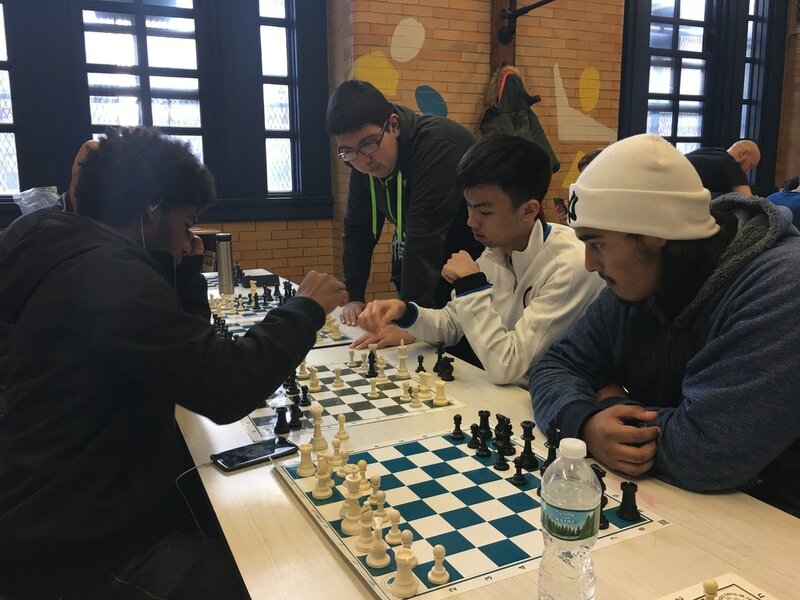 Warren (left) and Wesley conducting simultaneous exhibitions against the Roosevelt chess team (3/4/17). On Saturday, March 4th, 2017, Warren and Wesley, representing CHESSanity, traveled to the Roosevelt elementary school to conduct informal training sessions for the students part of the Roosevelt school chess team. There, they played a simultaneous exhibition with willing trainees as well as participating in a blindfolded game against some of the top students. 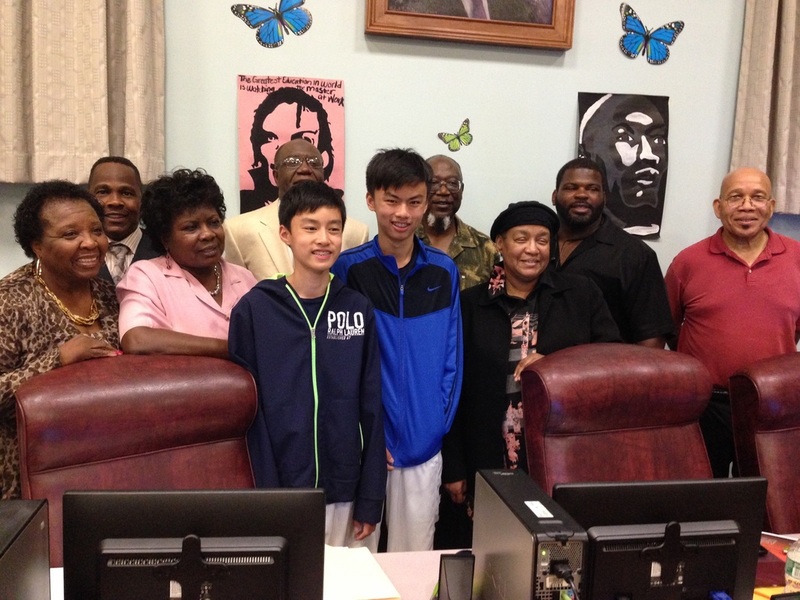 Warren and Wesley with some of the Roosevelt chess students (left) and Wesley and Warren with the winners of the blindfold chess game against Wesley. These students collaborated over the board while Wesley called out moves without sight of the position (right). The Saturday training session was a tremendous success. It was great to see the Roosevelt kids so eager to play against two National Masters and so willing to try and improve their game. They were all smiles after the win against Wesley in his blindfold game; you never know what some confidence can do for some kids! Lesson Time! These Hempstead children were complete beginners before the lesson started and did not know how to move the pieces or set up the boards. Fortunately, interactive learning and play got their minds working, and they're sure to come back in two weeks better than before (3/23/17)! On Thursday, March 23rd, 2017, Warren and Wesley, representing CHESSanity, traveled to Jackson Main School of the Hempstead UFSD, teaching chess to hand-picked students from 3 different elementary schools. After an hour and a half of interactive learning and play, these 21 students have walked away with a newfound knowledge, and possibly, a passion. We are to come back every two weeks and give similar intensive training sessions. Many thanks to principal Mr. Richard Brown of the Jackson Main School for making this happen! Note: 30 chess sets, books, and bags were donated: each kid got to take home one of each!